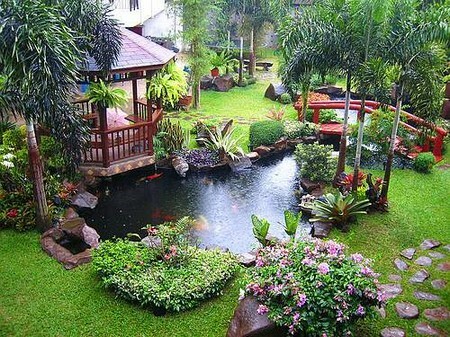 Most people find water fascinating and even a small pool makes an attractive feature. In a backyard there may not be enough room for anything extravagant and a small square brick pool will often suffice. Stone pools can be bought and they look better than a plastic-lined one. 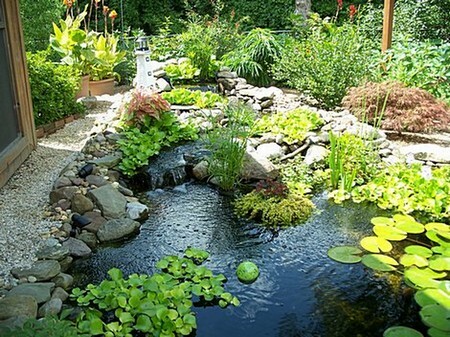 If you have not got room for a proper pond or don’t want to have it as a permanent feature you could make a water garden in a half beer barrel. They will remain watertight if the wood is kept wet. Even if you just grow a couple of water lilies in it, the effect will be pleasing. Still water tends to go green and slimy but this can be avoided by having the correct balance of oxygenating plants. Suitable oxygenators include elodea (Canadian pondweed), hottonia (water violet) and sagittaria (arrowhead). You will need at least 10 plants for every square metre (square yard) of water surface. The problem will not arise with running water and a simple waterfall can be created down brick steps or over cobbles. Fountains are also very soothing and pumps to circulate the water can easily be bought from garden centres. But bear in mind that they need an electricity supply. If you haven’t got room for a pool you could have a fountain coming out of a wall, a bowl-shaped one or even a lion’s head. If you want to do something a little different you could have a mural on one of the walls, perhaps a garden scene to act as an extension to the garden or something on a grander scale as a form of escapism. Or if that idea does not appeal to you don’t forget that different effects are created by painting boundary walls in plain colours—green to blend in with the scenery or a brighter, bolder colour to add contrast. To complete the scene what about some lighting—to illuminate the barbecue on a warm summer evening or simply to light up the garden so that you can look at it from inside? Light shining on to a water feature or statue will create a completely new aspect to the garden. The lamps will need to be made of weatherproof material such as good quality wrought iron. There are many different types of wrought iron lamps, either on stands or for fitting on to a wall. You can either have a modern design or an old-fashioned one, depending on the type of garden, and there are even stone ‘Chinese’ lanterns available. As well as lamps for lighting a patio area or path there are also spotlights to illuminate a certain part of the garden. They can be placed unobtrusively among shrub borders and come in several different colours. Underwater lighting can create an attractive effect, the lamps can either be submerged or floated on the surface. They are sealed units with a waterproof housing to make them safe. Also available are ‘light fountains’—the water passes over different coloured lights to produce coloured jets of spray. An added advantage of lighting is that it may deter burglars. It is possible to buy lamps with a built-in light detector so that they will switch themselves on when it gets dark. Special care must be taken when electrical appliances are used outside and all the fittings and cable should be completely weatherproof and comply with current regulations. It is a good idea to have two-way switches so that the lights can be switched on and off from indoors. A safer way of using electricity outdoors is to have a transformer from which 12 volt appliances can be used. Lighting systems are sold complete with a transformer and low voltage cable. This means that if there is a fault or a child tampers with the lights they are not lethal. Pool pumps and barbecues can also be run on a 12 volt supply. If you do run outdoor appliances off a 240 volt mains supply it will be much safer if you use a residual current device, or earth leakage circuit breaker, to give it another name. These can be bought to replace a normal socket outlet. As well as lighting, an electricity supply might be needed for a pool pump or an electric barbecue. If you do not want to go to the trouble of having an electricity supply run out to the garden there arc now modern versions of the old oil lamps that can be bought in a variety of bright colours. They can be put on a table or secured on poles and stuck in the garden or a flower pot. Night flares arc also good for an evening barbecue. You may have room in your garden for a small greenhouse which, if it is a good design, will make a feature in itself. There are several shapes to choose from and probably the best choice if space is limited would be a hexagonal one. There are also domed greenhouses but these don’t look as decorative. If you need more space for growing you might want a rectangular shape of which there are many. Red cedar construction looks the best but it needs to be well maintained. Aluminium is an alternative, it doesn’t look as attractive as wood but it has the advantage of requiring little maintenance. Lean-to greenhouses and conservatories can be used for growing plants and as an extension to the living area. Some of the Victorian-style constructions look very impressive and there are small versions as well as the grand styles seen on large houses. If you prefer just to sit and watch your garden rather than participating in greenhouse work you may like to have a summerhouse. I know they are mostly seen in big gardens but there’s no reason why they aren’t suitable for a small one. Apart from sitting in they can also be a useful place to store a few tools, or furniture in the winter. On similar lines, but purely for decoration is a gazebo, often made out of fancy wrought iron work; they can even be bought from department stores now. They look delightful with climbers growing up over them and will provide a pleasant place to sit on a hot day. Another way of adding height is to have a pergola for plants to climb up. It may be made out of timber or metal and can be used to make a covered walkway or sitting area. The construction should not be too big, otherwise the effect might be overpowering in a small space. If you want to be really grand there are pergolas with stone pillars available, but they tend to look better in large gardens.